TGIF!! It’s Friday! We made it another week! Haha, I feel like that sometimes with my two littles. The week can drag on and it seems like it will never end! Then there are weeks that just fly by! The joy of parenting! Anyway, I’m back today with my Friday Favorites. Last week I took a short hiatus as I had a post I did for the Super Bowl this weekend! 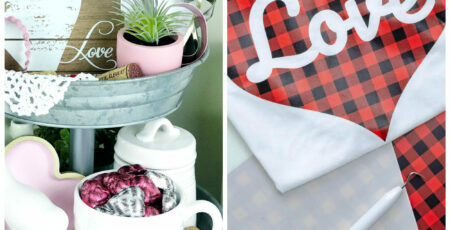 With Valentine’s Day around the corner, I thought it would be fun to compile a list of fun projects and crafts for you! You can make them with kids or use them as decor for your home! What are your plans for Valentine’s Day this year? Happy Friday my friends! I hope you have a wonderful weekend! My parents are coming into town so there will be fun to be had! I love watching my girls adore their grandparents! It’s so much fun to see the love there on both sides!